Hundreds of people gathered on the rocks of the jetties at Isla Blanca Park last Thursday afternoon to say their final farewells to the USS Independence, a Forrestal class aircraft carrier with nearly four decades of service in the American Navy fleet. “I just wanted to see it,” said Pete Rico, who traveled with his wife all the way from Tulsa, Oklahoma just for the occasion. “(It was) a 14 hour drive,” he said. Rico served aboard the Indy from 1965 to 1968, he said. Though he was somewhat sad to see that the ship will be dismantled, he understood why it will be. It needs to be recycled. The taxpayers have been paying the storage fees up in Bremerton, Washington where it came from,” he said. 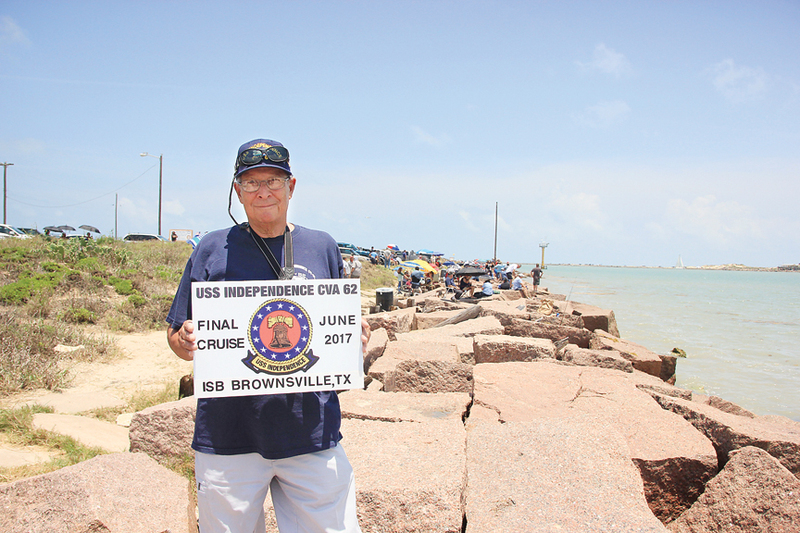 After waiting on the jetties for six hours, Rico stood with his back to the water as his wife took a photograph of him holding a sign in the Independence’s honor.